At The Dam we recognise the importance of early socialisation and interaction, so have organised weekly puppy parties. 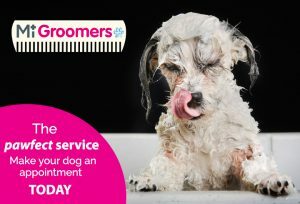 They are great fun for the puppies, provide the opportunity to discuss any problems, pick up tips from our experienced nursing staff and behaviourist, receive generous discounts and try some samples. All free of charge. Invitations will be posted the month after your puppies first vaccination*. If you are interested in coming along to one of our puppy parties please call or speak to one of our staff at your puppies first vaccination appointment. Having a new puppy in the family is a very exciting time for all concerned. Whether you are a new owner or not there is plenty involved and lots to remember. Socialisation for your puppy is a key part of influencing future behaviour traits as they progress to adulthood. The first twelve weeks of a puppy’s life is known as the socialisation period. Anything that a puppy experiences at this point has a significant impact on its future life. Therefore your puppy needs to be introduced to new environments and should learn how to interact with adults, children and other dogs. If dogs are not socialised as puppies or are left with negative experiences in their lives it is likely to affect their adult behaviour. This can lead to fearful and aggressive behaviour in your dog and once behaviour like this is present it is very difficult to break the habit. So what do these parties offer and how do they benefit your puppy? Puppies are introduced in small suitably matched groups to socialise. As well as meeting other dogs and owners they are introduced to new toys and can be rewarded for good behaviour. This creates positive and fun experiences for your puppies. Qualified staff can assist you with training methods and give demonstrations of simple commands. Puppies receive a positive experience whilst being in the clinic so they are not intimidated when they come in future. They also have the opportunity to meet and become familiar with some of the staff. Puppy parties are an excellent opportunity for owners to pick up some good tips and advice. The staff will go through basic puppy care and provide information on training, worming, flea treatments, nutrition, behaviour, grooming and anything else you would like to hear about. Many owners find it very helpful to discuss experiences with other owners. The puppy party is a perfect opportunity to do so and staff members are available to answer your questions privately if there are specific issues you wish to discuss.